People often confuse the terms memory and storage, especially when describing the amount they have of each. The term memory refers to the amount of RAM installed in the computer, whereas the term storage refers to the capacity of the computer’s hard disk. 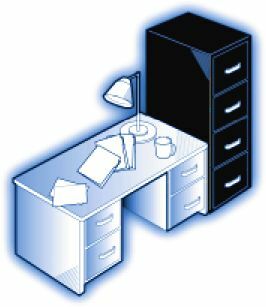 To clarify this common mix-up, it helps to compare your computer to an office that contains a desk and a file cabinet. The file cabinet represents the computer’s hard disk, which provides storage for all the files and information you need in your office. When you come in to work, you take out the files you need from storage and put them on your desk for easy access while you work on them. The desk is like memory in the computer: it holds the information and data you need to have handy while you’re working. Consider the desk-and-file-cabinet metaphor for a moment. Imagine what it would be like if every time you wanted to look at a document or folder you had to retrieve it from the file drawer. It would slow you down tremendously, not to mention drive you crazy. With adequate desk space – our metaphor for memory – you can lay out the documents in use and retrieve information from them immediately, often with just a glance. Here’s another important difference between memory and storage: the information stored on a hard disk remains intact even when the computer is turned off. However, any data held in memory is lost when the computer is turned off. In our desk space metaphor, it’s as though any files left on the desk at closing time will be thrown away.